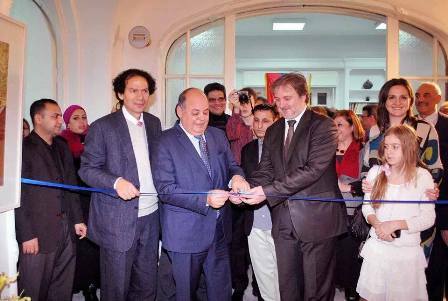 Minister of Culture, Dr.Mohamed Saber Al Arab and Ambassador of the Republic of Serbia Dragan Bisenic, inaugurated on Tuesday, February 18th, the exhibition of the famous Egyptian artist Ibrahim Ghazala "Serbia in the open air" at the Egyptian Center for International Cultural Cooperation at Shagaret el Dorr street, Zamalek. At the opening of exhibition attended numerous famous Egyptian artist and public figures: painter George Bagori, Ms Camelia Sobhi first Undersecretary for international cooperation, Mr. Mohamed Abu Saada, Chief of the Cabinet of the Minister of Culture, Dr. Salah El-Meliegy, Director of Cultural Development Fund and Dr. Hamdy Abu Al-Maaty. Exhibition includes 35 paintings,the artist drew during his visit to Serbia during last summer. Theme of exhibition is life and nature in Serbia. Exhibition will be open until February, 28th this year.